There are only seven books in the original Harry Potter series, but there’s no shortage of swag related to J.K. Rowling’s wonderful wizarding world. Here are 11 gifts to give your favorite magic-loving muggle this holiday season. 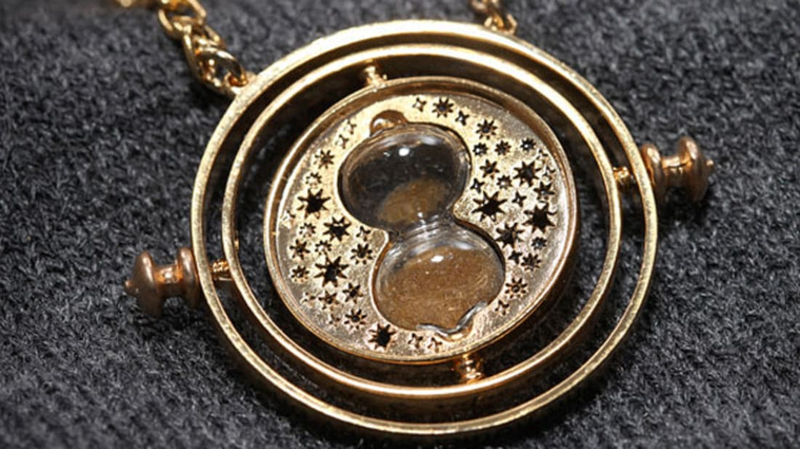 Hermione’s time turner was one of the most desirable items from the Harry Potter franchise—and it also made for a pretty stylish accessory. Now, you can rock Hermione's powerful pendant with an authentic replica of the prop used in Harry Potter and the Prisoner of Azkaban. The 24-karat gold-plated necklace features rotating inner rings with a miniature hourglass inside. The time turner is more of a collector’s item than a toy, and it comes with its own special display case for safe-keeping. Unfortunately time-traveling abilities aren’t included. Ever wonder what butterbeer or pumpkin pasties taste like? The Geeky Chef Cookbook gives readers the chance to find out without making the trek to Hogsmeade. Written by fictional food chef and blogger Cassandra Reeder, this book includes treats from Harry Potter as well as other sci-fi and fantasy classics like Doctor Who, The Legend of Zelda, Star Trek, and Game of Thrones. The recipes have been tailored to only include non-magic ingredients, though the end results taste pretty magical. J.K. Rowling’s break from the Harry Potter universe didn’t last long. She recently tried her hand at writing for film for the first time with her script for Fantastic Beasts and Where to Find Them. The story follows magizoologist Newt Scamander in early 20th century New York, 70 years before the events of Harry Potter take place. After watching the story unfold on the big screen, fans can pick up a hardcover copy of the original screenplay. Writers who solemnly swear they’re up to no good will love this ruled notebook from Moleskine. The cover design features the Marauder's Map with the layout of Hogwarts castle continuing on the inside. The book also comes with a set of Harry Potter stickers and a polyjuice potion ribbon bookmark to hold your place when mischief’s been managed. From the invisibility cloak to the sword of Gryffindor, the world of Harry Potter is full of fantastical objects. PopChartLab managed to fit the most comprehensive list possible onto one 18-inch-by-24-inch poster. The items are broken up into categories, including portkeys, legendary magical artifacts, and Weasley’s Wizard Wheezes. If you can’t make it to Diagon Alley to pick up some items in person, this illustrated chart is the next best thing. This detailed coloring book lets you explore places from Harry Potter in a whole new way. It contains 96 pages of settings from the fictional universe, from the Dursleys' living room to Hogwarts's great hall. No wand is required to bring these scenes to life—just a set of colored pencils. There’s no better way to start the morning than with a cup of hot-brewed mischief. This Marauder's Map-inspired 11-ounce mug changes color from black to white, reading “I solemnly swear I am up to no good,” and then “Mischief managed.” Any magic trick that’s also an excuse to drink coffee is a good one in our book. If you’re having trouble picking out just one Harry Potter keepsake, Loot Crate offers bimonthly boxes of goodies for $35. Each crate offers exclusive and officially-licensed figures, memorabilia, and apparel relating to Harry Potter and Fantastic Beasts. Just input your Hogwarts house and t-shirt size to get a customized Loot Crate delivered straight to your door. With this cooperative deck building game you can take your love of Harry Potter to the next nerdy level. Harry Potter Hogwarts Battle is made up of seven sequential games that become increasingly difficult as they progress. As players defend Hogwarts from villains like Voldemort, they collect items, learn spells, and make allies along the way. The folks at Juniper Books have found a way to make your collection of Harry Potter books feel a little more personal. Each brand-new book in the set has been slipped into a jacket displaying original designs inspired by the four houses of Hogwarts. The covers depict the vibrant house colors as well as the animal mascots. Whether you’ve been sorted into Ravenclaw, Gryffindor, Hufflepuff, or Slytherin, these sets are a perfect way to show the world where your allegiances lie. Whether you’re watching a quidditch match in the rain or strolling through the grounds of Hogwarts, it’s important to stay bundled up. This reversible scarf—officially-licensed by Warner Brothers—features the Hogwarts name and logo on both sides. You can wear the black and white side facing forward and then flip it over to reveal the same design in black and gray. The maroon, yellow, green, and blue tassels represent colors from all four Hogwarts houses, which means a Gryffindor will look just as sharp in it as a Slytherin.